2013 HMS Shannon and USS Chesapeake silver, gold and platinum coins have been issued by the Royal Canadian Mint to commemorate an important naval battle fought during the War of 1812. HMS Shannon & USS Chesapeake coins are available in denominations of $50 silver, $500 gold and $300 platinum. Each depicts the same reverse image of an 1812 battle fought between the Shannon and the Chesapeake. Tension between the United States of America and the British Empire was at its peak during the War of 1812. Not surprisingly, the British colonies of what would become present-day Canada were drawn into the hostilities as their inhabitants fought to preserve their way of life with their ports serving as safe harbors for British war ships. "On June 1, 1813, HMS Shannon, commanded by Captain Philip Broke, clashed with USS Chesapeake 40 kilometers east of Boston in a battle which would sway the morale of Royal Navy grappling with a string of recent losses to U.S. warships," describes a release from the Royal Canadian Mint. "Captain Broke and his outnumbered crew’s determination to restore the pride and confidence of the Royal Navy brilliantly defeated and captured USS Chesapeake in one of the bloodiest naval battles of the War of 1812." Following the capture of the Chesapeake, the British forces brought her to the port of Halifax (in present day Nova Scotia). There she was repaired and reflagged as the HMS Chesapeake. 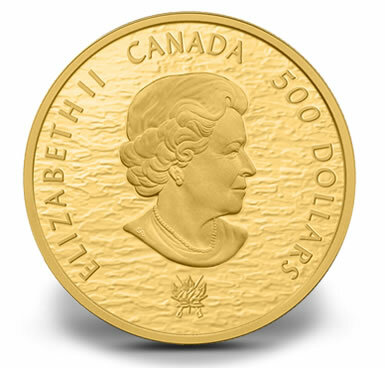 A design by Canadian artist John Horton graces the reverse of each coin. This design shows a scene from the final battle between the HMS Shannon (right) and the USS Chesapeake (left). A bilingual inscription in French and English appears at the top reading "THE/LE SHANNON AND THE/ET LE CHESAPEAKE." Beneath the design, "1813-2013" can be seen. Susanna Blunt’s effigy of Queen Elizabeth II appears on the obverse of each commemorative. Inscriptions include "ELIZABETH II," "CANADA" and the legal tender face value of the coin. Below the portrait is the insignia for the war of 1812 bicentenary. Each is encapsulated and presented in a maroon Royal Canadian Mint clamshell presentation case. A serialized certificate is also included. 2013 HMS Shannon & USS Chesapeake coins can be ordered directly from the Royal Canadian Mint by calling 1-800-267-1871 in Canada, 1-800-268-6468 in the US, or online at www.mint.ca. 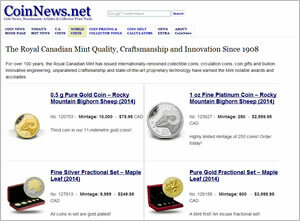 Current pricing of the commemoratives is listed as CAD $11,999.95 for the gold coin, $2,999.95 for the platinum coin and $499.95 for the silver. Pricing is subject to change. Update: The platinum coin is now listed as sold out. Why would i buy a coin in commemoration of a Canadian victory? What, you think egotistical, self-centered, snobbish Americans like you are the only ones who collect coins or read this forum? Did you know that the internet reaches all around the world and not just to the US? Grow up and be a little more tolerant of others who read these articles and have interests that go beyond you and your tiny little world. Sam – the same reason you would buy a Roman coin that celebrates their victory over their numerous foes. You buy it for its beauty. I usually don’t collect modern coins from other countries but as a naval history buff this is an incredible design. This coin is much better than our mint would produce because our coin would show some bland PC design that would soon be forgotten. Just because you are not Canadian – and I am not – you can appreciate an incredible design that harkens back to the day when the Man-O-Wars sailed the oceans and the sailors and Marines fought intense, bloody battles for dominance of the seas. Canada is the largest trading partner for the US. Canada is the Northern half of North America. The RCM produces many fine coins. Please do not be small minded in your commentary with CoinNews. It is a global internet. 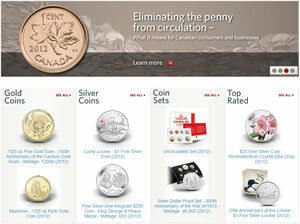 I love just about every coin that the Royal Canadian Mint puts out. They do a great job. This is a gorgeous piece with only 250 mintage. Keep up the great work Canada as well as the U.S. Mint. Sorry, I was referring to the Platinum coin with the 250 mintage. They are all beautiful pieces the 3 of them. Jim- Coinnews is a website based mainly for the intrests of US coinage. I meant as an American I would not collect any type of Anti-American Commoritive. Jim- Find your own Queen loving coin website. Stay off our websites, I though we kicked you out over 200 years ago!